If you like portable applications, surely you know about PortableApps.com. I think the most prominent projects of the website are OppenOffice Portable, Firefox Portable, and GIMP Portable. But recently, since I subscribed the RSS, there are more and more new applications in PortableApps.com, such as the game like “Frets on Fire”, the online game “The Mana World”, etc. This is very interesting. Portability is a very convenient feature because this allows us to bring our applications by using a USB pendrive. And sometimes, we need administrative privilege to install the applications. But portable applications just let us extract it, then we can run the applications anywhere. The growth of PortableApps.com shows that the open source applications are growing. Not only that, portable applications are also growing. More and more people will prefer portable applications. Previously I said that Firefox is just like an OS (Operating System), with the add-ons like the applications. If this is the metaphor, then all the bookmarks will be the important files that we own. Sometimes I will reformat the harddisk and reinstall Windows due to some error, registry corruption, virus infection, some unexpected performance, etc. And recently, I found that my Firefox have some problems. When the Firefox opened for a long time, 2 or 3 hours, there will be a high CPU usage. Which hinders me to work properly. I don’t know what happened, may be add-ons. I tried to uninstall some of the add-ons, but the problem still there. So, the final solution is “reformat” it. But unlike Windows, we no need to reinstall the Firefox. Just go to “%USERPROFILE%\Application Data\Mozilla\Firefox\Profiles”, delete the profile, and run the Firefox, everything will be fresh. But remember, always backup the data: bookmarks. Besides that, since I got some add-ons, I need to export some of the setting, so that I do not need to set everything after reinstall the add-ons. Another thing I used for backup is FEBE. So that I can install all my add-ons later offline. Once start the fresh Firefox, go to “Tools>Add-ons”, then just drag-and-drop all the add-ons backup(ed) by FEBE to the Add-ons dialog. So, all the add-ons can be installed in one go. Restart Firefox, then setup for our own preference. Now, my Firefox is faster than before. A very bad experience for me to upgrade COMODO Firewall. The update was slow. So I decided to download the latest version installation file. Then tried to install from the latest version. And the installation detected the existing of the older version. I was asked to uninstall the older version. Right, I uninstalled it. Then I was asked to restart the computer. But I didn’t restart. (I know, this was my fault). Then I continued installing the latest version. Finally, restarted the computer. Okay, the problem came. Could not run the firewall. Could not go online. $#*! Then, I used Sysinternal Autoruns to disable all the COMODO related services and startup. Yeah, I could online again. But, when I wanted to install the firewall, it still detected the old firewall, and asked me to uninstall it. But I could not uninstall it. I was asked to uninstall using the “cfpconfig.exe -u” command. But there is no “cfpconfig.exe” in the COMODO folder. I knew it is related to the Windows registry. But I was not dare to remove anything. Afraid that I make another mistake. Since I could online, I searched from the net and found this forum. The forum got a link to download CFP3 Registry Cleaner. Download it, run it. Yipee! Now I can install the firewall. Conclusion: If upgrading a product, follows the instruction properly. Besides that, COMODO Firewall should have a better design in the upgrading feature. For me, Firefox is just like an operating system, with the add-ons like the applications. I always have a problem on managing the tags of Firefox 3. Unlike the bookmark system of the other web-browser, tagging is allowed for the Firefox. 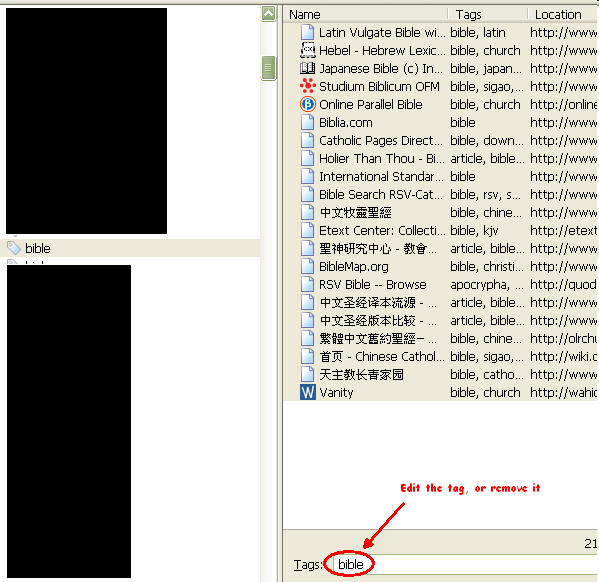 The tagging feature is based on the SQLite database in Firefox. I had an experience that I corrupted the tag because of installing the Wizz RSS in Firefox. Thus, I seldom manage the tags. And previously, I installed StumbleUpon toolbar, this add-on generated a lot of tags which I don’t like. And today, I finally figure out that, if I go to “Organize Bookmarks…”, and select one of the tag, then highlight all the bookmarks within the tag, then I can remove the tag, rename the tag, or add in new tag for the selected bookmarks. I know it is able to right-click the tag and chose to “delete” the tag, but I didn’t tried it because I afraid the tag is removed, but the bookmarks still remain in the database. Because if I “rename” the tag, duplication of the tags will occur, Firefox will not automatically merge the duplicated tags. Previously, I was using FeedReader to read the news with RSS and Atom. I like it, since it has the portable version. But after I uses Xmarks (previously Foxmarks) for Firefox, the bookmark synchronisation helps me a lot. Because No matter which PC I used, the bookmark will always sync to the server. But the news feed reading is quite troublesome. Because I need to update for both PCs if reading news feeds using the desktop client like FeedReader. Then I tried to search around which can solve my problem. The web-based service is the solution. There are two services I tried: Google Reader and Bloglines. However, I prefer Google Reader, since there is a Firefox, Google Reader Watcher, to notify the update feeds. Unlike Brief, the feeds are stored in Google Reader, thus, different PCs allows me to continue my feeds reading. I am now using Iron portable version. Very nice.